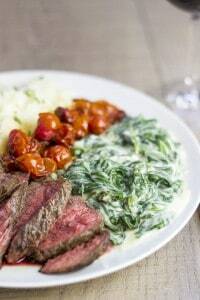 Creamy, rich Morton’s Steakhouse Creamed Spinach Recipe that takes just a few minutes and is the perfect side for a holiday roast or prime rib. Creamed Spinach, but I’ve made it cheesier! This one is a spot on copy for Morton’s Steakhouse . I serve it with my Cast Iron Ribeye, Roasted Garlic Cherry Tomatoes and Classic Easy Mashed Potatoes as our traditional Christmas Eve dinner. You can also go the opposite way and use heavy cream. Your taste buds will love me, your jeans may not but hey it is the holidays! If you’d prefer to use frozen spinach, just defrost and squeeze out as much water as you can. – Use 1 pound of frozen spinach. Nutmeg may seem like a dessert spice but you’ll love the flavor in this recipe. Aside from the classic Morton’s recipe I’ve added cream cheese and Parmesan cheese. 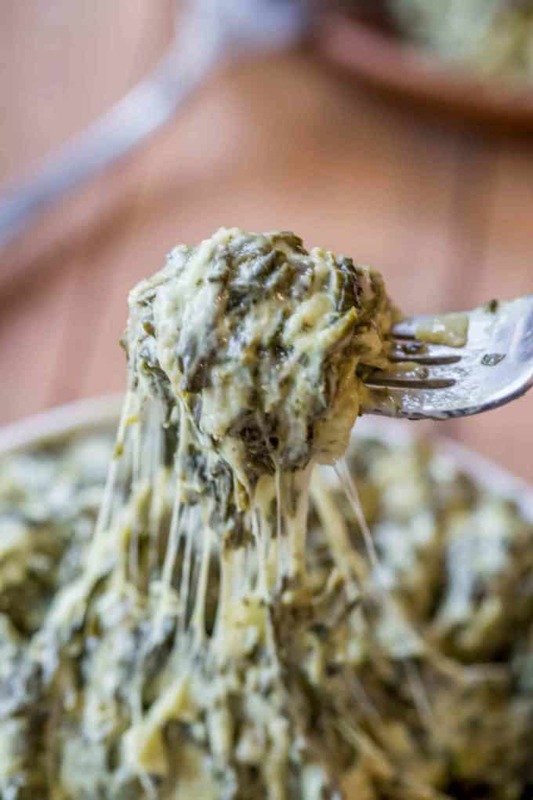 One of my favorite things to do with the leftovers if there are any is toss some cooked pasta in with it, add a bit of mozzarella and cream cheese for an easy spinach pasta bake. I usually just cook on 350 degrees for 15 to 20 minutes, no recipe here, it is usually just whatever is left over. In the case of this specific dinner we had, I actually added pasta back into my cast iron skillet I made the spinach in and baked it off with pasta with the leftover grape tomatoes too. It was a HUGE hit in our house. I love when leftovers can actually morph into something new and not feel like a leftover. Strainer: These hang next to the sink because I use them so much. No rusting and inexpensive! 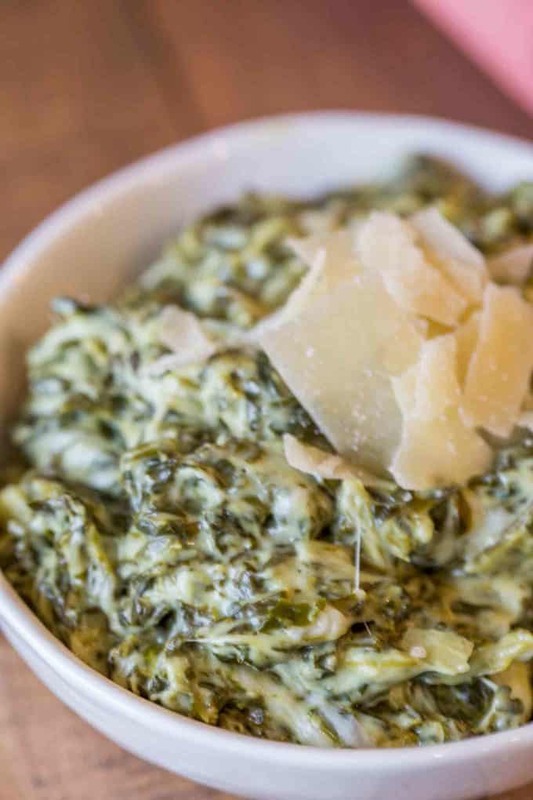 Creamy, rich Morton's Steakhouse Creamed Spinach that takes just a few minutes and is the perfect side for a holiday roast or prime rib. Bring a large pot of water to a boil with two teaspoons of salt. Add the spinach and cook just until wilted, about 1 minute. Drain the spinach in a strainer or colander. Rinse with cold water until cool and squeeze the water out of each fistful of spinach. Chop the spinach bundles into a 3/4 inch width. In a large skillet melt the butter with the garlic and onions. Cook on medium low for 8-10 minutes or until the onions are translucent. Add in the remaining kosher salt, black pepper and nutmeg. Add in the flour and mix with a wooden spoon over low and cook for 2-3 minutes until the aroma is a bit nutty. Add the half an half and cook until boiling. Cook for 6-8 minutes or until the mixture has thickened. Add in the spinach and the Parmesan cheese and stir to combine. Recipe adapted from Morton's Steak Bible. I also added cream cheese and mozzarella cheese. For a perfect copycat, omit these. Lol… I made this and everyone loved it….. but since sometimes things just don’t go as planned I used a big bag of chopped stir fry veggies. Was fabulous with roast turkey and I didn’t say a word. Did use almond flour to keep the carbs down. I made this last night with a couple porterhouse steaks…..fabulous! I did add some of the extra cheese you added to your recipe but not the entire amount. Fabulous. 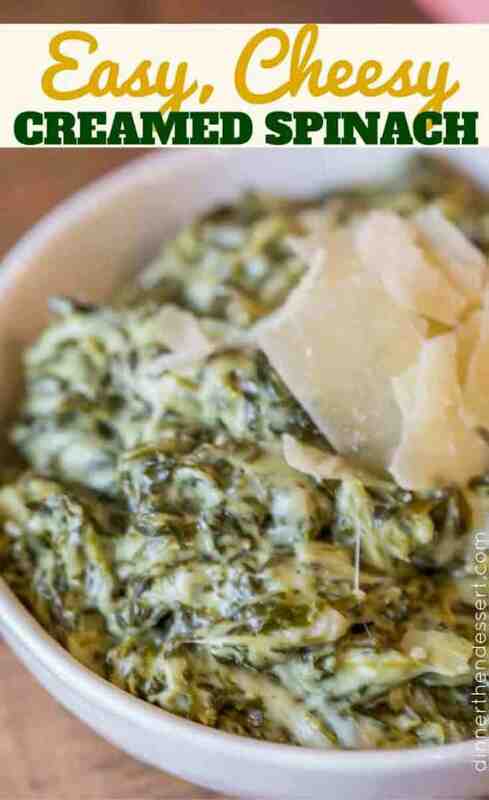 Anyone that enjoys spinach and wants a great new eat to serve it needs to try this recipe. Not hard at all. I used provolone instead of mozzarella, green onions instead of yellow. 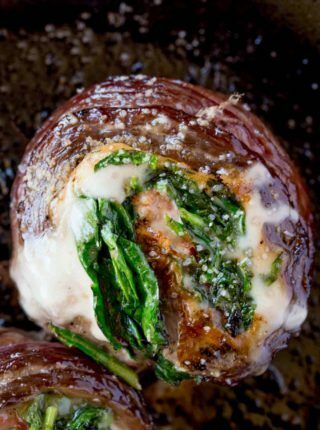 Otherwise followed recipe, I don’t like spinach, but wow. This is good. I’m so glad you enjoyed it, Tracy! I’ve tried other recipes. This one is the best. I added gruyere instead of mozzarella and used fresh spinach. AH-mazing!!! We his recipe was absolutely wonderful. The leftovers, and I had to fight my husband to make sure there was some, we’re also delish with pasta. This will go to the top of my favorites. I found it too rich for a stand alone veggie with The mozzarella. I think it would be best to use as a stuffing or topping for a lean fish, chicken or pork instead as a vegetable. Made it. Loved it! Saved the recipe. I halved the recipe since I only cook for two and I used bagged frozen spinach. Paired it with some baked cod. I scooped out some of the cream sauce, before adding the spinach, and poured it over some cooked rice to eat later. ? I give this recipe 10 stars!! So sweet of you to say, Janet! I’m so glad you enjoyed it! This is by FAR the best spinach recipe ever. Tastes just like Morton’s… the code has surely been cracked in regards to their secret ingredient (nutmeg). ?? Delicious! I used heavy cream and almond flour to keep it Keto! This is an amazing side! Thank you for the recipe! Made this for my husband’s birthday and it was the biggest hit!!! Served it with seared duck breast with cherries and port sauce and a brown rice medley. My family said I have to bring this to every dinner from now on. One thing that happened while I was making it: I discovered I didn’t have enough 1/2 and 1/2 and the flour was browning. So I added 1.5 cups of chicken stock to give me 3.5 c liquid and went ahead making the sauce. It turned out fine. I think the cream cheese makes it rich and creamy, so it was pretty forgiving. I will probably do this from now on. I just tried this recipe. Mine ended up a little bit creamy, but it was delicious!! Poured it over some baked chicken breast =P yum!! The recipe is fail proof! I have made it six times, perfect for those on keto diet. I replace the half and half with heavy cream and flour with almond flour and it tastes absolutely amazing. It’s a rich dish but truly easy to make. Btw I use frozen chopped spinach, 4 packs for this recipe. Thanks for the 5 star rating, Mark! So glad you’re enjoying the recipe. 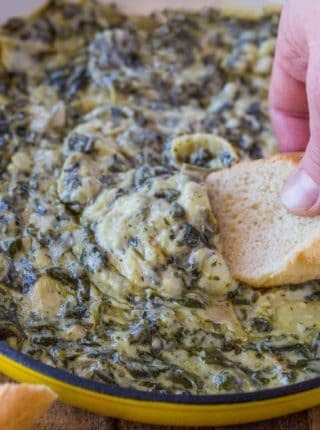 I love creamed spinach and This recipe was amazing! 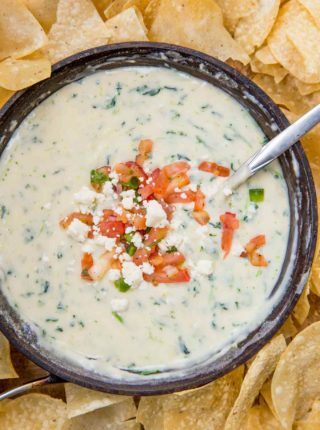 I made it for Christmas and at first it was mistaken for the most delicious dip ever. We all enjoyed some dip and then it was the best side at dinner. It turned back into dip later that evening and the following day with the leftovers. I did not use the cream cheese or the other addition so it stayed true to the Morton’s original recipe. I will be making this a lot and thinking about adding artichokes and crab to turn it to the ultimate dip. Thank you for the recipe!! This was perfect for Christmas dinner accompanying Beef Wellington. Had no cream or half and half in the house so substituted 3/4c buttermilk and the rest nonfat milk. Improvisation was still great! Froze half the recipe for later. Sounds like a delicious meal! So glad you all enjoyed it! Made it on Christmas to go with a standing rib roast. I’d been hunting for a recipe incorporating cream cheese but others failed to balance that with the classic bechamel and other cheeses. This recipe was the perfect balance. I used two ten-ounce packages instead of just a pound and it was just right — not too thin, not over-saucedt. I also doubled the recipe and stuffed both boneless chicken breasts and perch filets for chicken and fish Florentines with part of the second half and chopped up frozen baby artickokes to add to the rest for a dip that was great with freshly fried tortilla chips. Thanks for creating such a delicious, versatile recipe! P.S. I’m going to try this with fresh, undrained spinach added directly to the sauce between steps 12 and 13, then thinning with chicken bone stock to desired consistency after that, then putting in the bowls and garnishing with the parm and a wee sprinkling of nutmeg, finally flash toasting the top with a torch just before serving. Great recipe! Best Cream Spinach ever! Can I put this in a small crock pot after cooking to keep warm? Yes, just make sure to stir it occasionally. Enjoy! I’d make everything through step 9 ahead. Then 10 mins before serving add the spinach mixture to your skillet, warm gently then follow the rest of the directions. It’ll taste best when freshly cooked and it shouldn’t take much more effort than putting in the pan, lowering the heat and letting it all cook together for a final few minutes. Hope this helps! 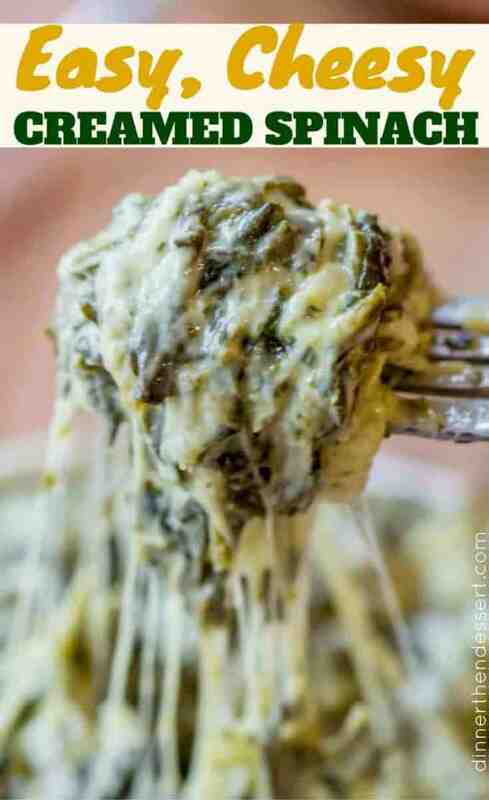 Amazing cheesy creamy spinach recipe! never cooked it before, but tried on the weekend with my gf, all went well until the lactose took effect and we started to fart non stopping!. Agreed, Paul! I’m also really glad to see they didn’t dock stars from the recipe just because of a personal issue! This looks incredible. I want to make it for Christmas. Can I make it earlier and reheat it? You *can* but here is the thing. Reheated cheese will never be as amazing as first melted cheese. My best advice would be to cook through step #8. Then on Christmas day add a tab of extra butter to start the engine back up, melt it and get everything loosened up then add in the flour and continue. The freshly added dairy will make a big difference. Hope you have a wonderful Christmas! like so few of the people who commented, I actually made this recipe. The flavor of the sauce was good, but it was a bit to thick and the proportion of sauce to spinach was way off. I weighed out my spinach at the grocery store, and again after blanching and squeezing out the water. It was 3lbs at the store, 1lb after blanching. it was basically all cheese sauce. ill make it again, but cut the sauce to 1/3 of the recipe and less roux. it was way too thick, not creamy at all because is was so congealed by the roux. I made this as a side for our Thanksgiving pot luck. 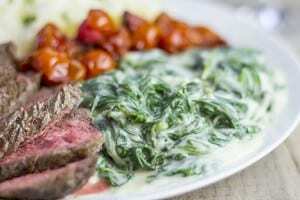 Many of my hubby’s family members have never had creamed spinach until now. 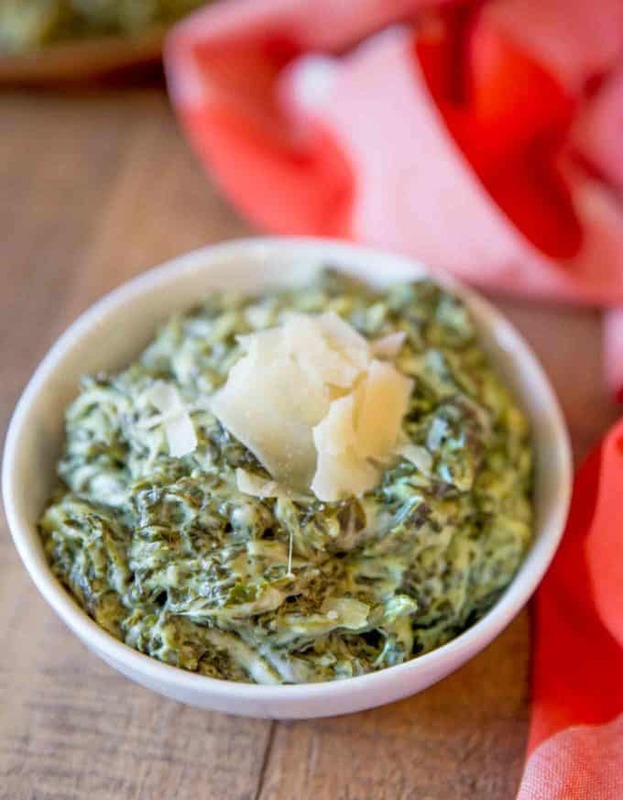 Let’s just say this was requested at next year’s gathering by EVERYONE… even the self proclaimed spinach haters lol! Perfect consistency! 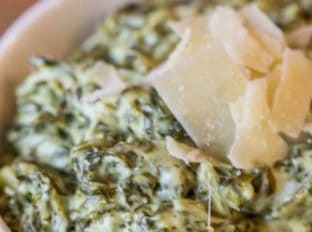 I used 4- 10oz boxes of frozen spinach … Put in a casserole dish after done and topped with italian blend instead of just parmesan… So amazing!! Thank you for this fantastic recipe ? I love seeing this, Tassie! Thanks so much for the 5 stars! Just made this for Thanksgiving as I usually make creamed spinach every year but always with different recipes. This is the best recipe yet. I used half of the heavy cream, half of the butter, and half of the flour. No mozzarella cheese but I had Gouda on hand so used that along with a little pepper jack. It was great and I’ll use this recipe again! Thank you. So glad you enjoyed it, Christy! This was the best I have tried. The cream cheese is an amazing addition! 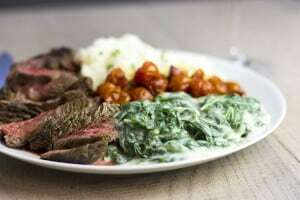 what do you do if youre using frozen spinach? Just defrost and squeeze out as much water as you can. – Use 1 pound of frozen spinach. I hope you enjoy it! The reason you need this step is to lower the volume of the spinach down in the pan. It takes just a minute. I hope you enjoy it! I made this using frozen spinach and I don’t think I used enough. The taste was delicious but it was more like a cheesy white sauce with some spinach in it. I put it over pasta and it was fabulous! 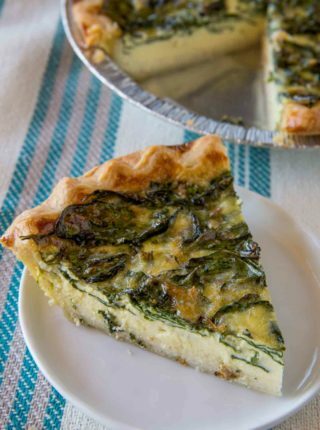 I am remaking this for thanksgiving and will add a lot more spinach this time. It should be wonderful! A nice change from the same old green bean casserole! Wow, that was delicious! First time I’ve tried creamed spinach. It’s a great recipe if you’re on a keto diet. (I added almond flour instead of regular flour and it worked fine). This recipe is delicious! I made it with frozen spinach and purchased 20 ounces (the recipe calls for one pound). The result was way too creamy without enough spinach so I went back and got another 20 ounces. Fabulous results. I would just make sure to have enough frozen spinach on hand (if you go that route) to adjust the amount to your liking. I just made this (without the nutmeg since I didn’t have any) for Friendsgiving tomorrow and omg…THIS IS SO FREAKING DELICIOUS! Stop what you’re doing and make this right now, you will not be disappointed. YAY!! So glad you enjoyed it, Alissa! I was wondering what the stars beside the cream cheese and mozarella cheese meant? I put a note at the bottom of the recipe to explain but it just means that I added those two ingredients but if you want a true copycat to Morton’s, you can omit them.